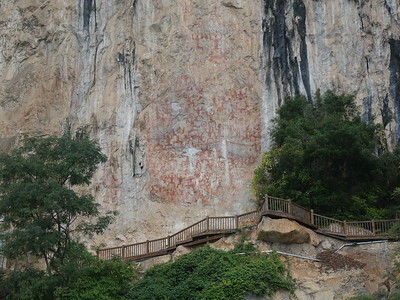 The Zuojiang Huashan Rock Art Cultural Landscape comprises three locations with thousands of pictographs, painted on steep cliff faces along the river in a karst landscape. The paintings were made by between the 5th century BCE to the 2nd century AD by the Luoyue people. The site is a cultural landscape and also includes hamlets and villages where people still perform rituals connected to the rock art. The pictographs can be seen from boats and wooden platforms. They cover four distinct phases of painting, and include depictions of bronze drums, ferry boats and human figures. Zuojiang Huashan Rock Art is a rather difficult WHS to fit into a China travel itinerary as it lies in the far south, in the Guangxi Zhuang Autonomous Region. But it works well coming from Vietnam: the daily night train from Hanoi to Nanning stops every morning at 7.10 in Ningming. From that station you are only a few kilometres away from the ‘entrance’ to the rock art landscape. I’ve written some more logistical details at a separate Forum post for those who consider taking the same approach. Having read the earlier reports by Zos and Zoë beforehand, I hoped to just find a taxi driver to take me to one of the viewing platforms instead of having to join one of the boat tours. But when I arrived it was raining and still dark. After some wanderings I found a tricycle driver, who dropped me off ca. 8km away at Zhoulian dock. I saw people doing construction work there, but not much else was going on. With the help of a translation app on her phone, one of the girls at the reception informed me that the first boat would leave at 11.30. That meant another 2.5 hour wait for me. But what else could I do – I was stuck. Around 11 o’clock more (Chinese) tourists starting showing up, some 20 in total. It was still raining but fortunately the boat that is used for the tours is fairly large and covered, like a small cruise ship. A guide also went along and started explaining enthusiastically about the landscape we were passing through. Along the route I noticed several unnatural elements such as fake trees and spotlights, as if the river landscape recently had been used as a stage for a theatre production. It took almost an hour before we arrived at the first rock paintings. They were all added to the light sandstone walls that now and then appear along this river. Ningming Huashan is the largest panel containing 1951 of the total of 4050 paintings. This is actually the only really interesting part of the tour: there are so many drawings on that one cliff that from a distance it almost looks red. It is striking how little variation there is in the images, they seem to be stamped. The explanation given is that they were subject to a strict set of rules - they evolved but the principles remained the same. The vast majority of them portray people (dancing puppets), there are circles with a star (representing bronze drums) and dogs. All this is linked to the ritual activities of the surrounding villages. There are no drawings of daily activities, as is common elsewhere in rock art. I find it always interesting to think about what has caused people to create rock art. This relationship with the community is very visible here at Huashan by way of the villages that are located opposite the cliffs with the drawings. On the way back we moored at one of them: Laijiang. At first sight it did not look much different from an average Chinese village. However, its orientation is to the river and boats lie ready to transport goods and people. So it’s not surprising that the ancestors had such an intimate relationship with the river that they drew paintings on cliffs where you could best view them from a boat. I must say that it was quite a miserable visiting experience overall. So how did this end up as a WHS anyway? I think much has to do with the very well prepared nomination file full of scientific explanations. The site is much better on paper than in reality. The area surely is not flooded with rock art and villagers that still worship it. I'd recommend to read about the qualities of the rock art and the interaction with local culture - for example at the website of the Bradshaw foundation - from the comforts of home. What a disappointment even with my low expectations for rock art in general. A lot has changed since the site has been inscribed and the town of Ningming has really been placed on the map. Known to local tourists before, the town has been upgraded with rock art copies to decorate lamp posts, supermarket roofs, even the factory chimneys, with the cutest one at the tunnel entrance to the scenic area that has the world heritage symbol as rock art alongside the stickmen/women found on the walls. TIC, or This Is China, refers to the fact that things change quickly here. Before one would have to find an obscure boat hire service to take you to see the rocks, then there was a ferry service twice a day, now there are regular tours from Zhulian Ferry Port every half an hour on weekends, and this was already early November. I regret not going directly to the scenic area onky a few kilometers further in because the ferry service is slow and you spend a maximum 10 minutes looking at one of the walls, with many rocks walls covered with scaffolding where they still do plenty of research on the art. There are some individual drawings on the way but it takes a good 45 minutes to the place they stop. They in fact spend more time stopping at the local village for the inevitable shopping, mainly fruit and snacks. The images at the port and even the entrance ticket make it seem as one can actually step on a nice wooden boardwalk in front of the art wall but this is in fact a misconception. The boardwalk is there but not accessible, and probably never was invented to be? You can see the art fine from the boat but it obviously feels misleading. I talk of regret without knowing what the scenic area offers instead, but for the short duration of seeing the rock art I would probably not take a ferry ride and risk the disappointment at the other area without the 3h waste of time on a “leisure” cruise where everyone picnics, and while the scenic views are nice this is nothing compared to Guilin and North Vietnam. If only another visitor would have correct information. Guide books still talk about the old ferries costing 35 RMB... The tour explains some icons but I got more info from the CCTV-1 program showing clips on the TV. You also see more of the rock art but I suppose one wants to see the real deal else we would be looking at pictures of every place to visit and be done in a day. So what makes this rock art so special? There's always the “most”, “tallest”, “oldest” criteria which for me is a non-factual argument that shouldn't fly. They discovered older art in Indonesia already. I am in favor of these nations at the UN to sit together and compare their findings or review if the rock art is actually unique. I found the ones in Denmark already just passable, France and Spain very much not, and then there are several unlisted places like Indonesia that may even be more unique than those. And if you do inscribe on superlatives than be prepared to be delisted. 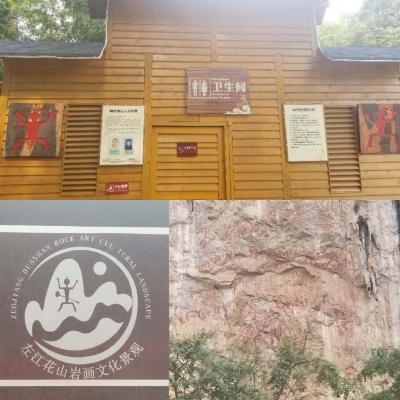 I would give this place half a star for the presentation but i believe there is something great about the large amount and how the people placed it on the wall so high, abseiling from the top or if the water level was so much higher than why there is rock art at the bottom areas too? A lot of rock art is unreadable or half washed away. I am of course a little bit biased having seen heaps of rock art before. I did think it was rather smart how some of these were painted to throw a tool on top to most likely symbolise the person's job or status. Logistic-wise I recommend taking a 2h bus from Nanning Jiangnan Station which is connected by the metro to not only the center but also all the way east to the other coach station, Longdong, and the east fast train station, or take a bus directly from Longdong which takes 3h and is not very frequent. If you come from Vietnam you stop at the old station in Ningming which is slightly closer to Huashan than the coach station but still requires transportation by taxi or motorbike. I don't recommend the train onward to Nanning because it's so much slower and less comfortable and hardly worth the cheaper ticket price. English information on Hanoi-Nanning train route is limited. But coming from Hanoi, the MR1 train actually stops at Ningming Country. Hotels in Hanoi can book train tickets – mine costs $35 USD to Pingxiang Border and I bought Pingxiang-Ningming at the station for 11 RMB. The train leaves Hanoi at 9:15 PM and arrives Ningming at 7:00 AM. Ningming really takes pride in their WHS. You can see the rock art figures printed all over town. They even put the UNESCO WHS logo in front of the train station - perhaps to remind travelers they are indeed not lost upon arrival on this sleepy town. And the ease of visiting this WHS stops here. There are no English signs pointing to Tuolongqiao Dock where boats supposedly to the scenic area are located. Locals are not of help either unless you speak Mandarin or local language. According to AMap (a Chinese map app) there are buses going to Huashan Murals. But the bus stops are nowhere to be found and there are no signs of it even on the GPS coordinate given by the map. Already tired and frustrated after 30 minutes of looking for the dock and bus stop, I gave in to the offer of the man who kept talking to me. He had a van parked at the station and he offered to bring me to the site and back for 100 RMB. It was still 8:00 AM so I figured he would just take me to the observation area the opposite bank as he pointed on the map. We drove though sugar cane farms on a road that is still being paved. The observation area too was still under construction, possibly to catch the tourist rush for 2018 Chinese New Year. Viewed from the opposite bank, the rock arts were still visible – hundreds of red anthropomorphic figures squatting with arms raised up. There was no English interpretation boards so it was difficult to place them into context. The view from the opposite side was picturesque – lush greenery provided a contrast to the murky water with the cliffs looming over. The river was idyllic. It set the tone on the relationship between the rock arts and the entire landscape and gave the sense of scale with the paintings splattered across the cliff wall. Seeing the rock art from afar took away the awe and the personal connection. Compared to my visit of Bhimbetka where I am in breathing distance to the paintings, Huashan experience paled in comparison. The surrounding landscape was scenic but it did not give me the emotional pay-off I was anticipating. From the opposite bank, the paintings seem impersonal and devoid of context even after reading the dossier and ICOMOS evaluation. I asked the driver if we can go to the opposite bank. He talked to the local boatmen to ferry me across the river. Unfortunately, they refused possibly because of the time or maybe the park was totally close on winter. We then drove back to the train station where I looked again for the bus stop but still no signs of a bus or any stop. I took the 11:15 AM train to Nanning which is 4.5 hours away. Missing the train meant the other option was to take the last train at 2:30 PM or stay overnight at Ningming. 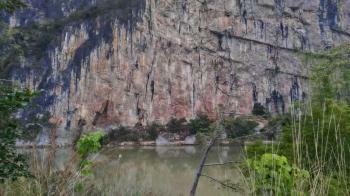 On T List as "The Rock Painting of the Mountain Huashan"